Lau are, without doubt, one of the most exciting and ambitious folk bands of their generation. They’ve been described as “modern folk’s most innovative band,” and have been winning awards, praise and plaudits since the release of their debut album Lightweights and Gentlemen in 2007. Since then, Lau have released four further albums, including their most recent album The Bell That Never Rang in 2015. However, when Kris Drever, Martin Green and Aidan O’Rourke are neither touring nor recording, they work on other projects. That’s been the case since the early days of Lau. In their downtime, the three members have worked on other projects. Despite these other projects, they’ve always returned to Lau, which the three members fondly describe as “the mothership.” The latest band member to leave “the mothership” was accordionist and electronics guru, Martin Green. He was a man on a mission. Martin Green was about to record his much anticipated sophomore album, Flit. It will be released on Reveal Records, and is the followup to Martin’s critically acclaimed debut album Crow’s Bones, which was released in April 2014. Crow’s Bones found Martin Green accompanied by an all-star cast of musicians. This included Becky Unthank, Inge Thomson Niklas Roswall and Portishead’s Adrian Utley. They played a part in the sound and and success of Crow’s Bones. Now just over two years later, and Martin Green returns with the much anticipated followup album to Crow’s Bones. After the release of Crow’s Bones in April 2014, Martin Green returned to “the mothership.” Now, Lau could begin working on their fifth album, which eventually, became The Bell That Never Rang. The three members of Lau began writing their fifth album. Once the album was written, Lau headed to their studio of choice, Castlesound Studios, in Edinburgh. That was where Lau were joined by Joan Wasser, who had been brought onboard to produce the album. When the album was complete, it became The Bell That Never Rang, which was released in early summer of 2015. Critical acclaim accompanied the release of The Bell That Never Rang, in May 2015. There was no doubt that Lau were “modern folk’s most innovative band.” They had released the best album of their career. All that was left, was for Lau to tour The Bell That Never Rang. Then the band could enjoy some much needed downtime. After a gruelling tour, many musicians would head off and enjoy a much needed a lengthy break. Not Martin Green. His thoughts soon turned to his sophomore solo album. Martin had had released his debut in Crow’s Bones in April 2014. With some free time, this was the perfect opportunity to record his sophomore album. So, Martin Green began planning what would eventually become Flit. Gradually, the album began to take shape. Martin wanted to record an album the documented stories of “human movement around the world.” To write, record and tell these stories, Martin enlisted the help of some of his many musical friends. This includes some of the biggest names in Scottish music. Mogwai’s Dominic Aitchison joined the inimitable Aidan Moffat of Arab Strap; Fife based folksinger Karine Polwart and singer songwriter Adam Holmes . They’re joined by American singer-songwriter Anaïs Mitchell; Betty Unthanks of The Unthanks and Portishead’s Adrian Utley. Together, this multitalented, all-star cast of singers, songwriter and musicians joined Martin Green to write and record his much anticipated sophomore album, Flit. Having explained the the concept of Flit, which was “human movement around the world,” Martin Green and Friends began work on the album. Eventually, a total of nine songs were written some talented songwriters. Martin wrote Clang Song and Smallest Plant. He cowrote Strange Sky, Wrackline, The Suitcase and Laws Of Motion with Karine Polwart. Martin wrote the lyrics to the other three songs, while Aidan Moffat penned the lyrics to The Living Wind; Anaïs Mitchell added the lyrics Roll Away and Sandy Wright was responsible for the lyrics to The Singing Sands. With the songs complete, recording began. Recording took place at 245 Studios, in Bristol, where Martin Green and Adrian Utley took charge of production while T.J. Allen was the enginner. During the sessions, Martin Green played accordion, mellotron, synths and was involved with sampling. Meanwhile, Mogwai’s Dominic Aitchison laid down the bass lines. Adrian Utley switched between acoustic and electric guitar to bass, percussion and synths. Corrina Hewat was drafted in to add harp. This left just the vocals to be recorded by Adam Holmes, Betty Unthanks, Aidan Moffat and John Smith. Gradually, the album began to shape. Later, addition recording sessions took place at Chapel Studios. Eventually, the recording sessions were over. This left just mixing and mastering. 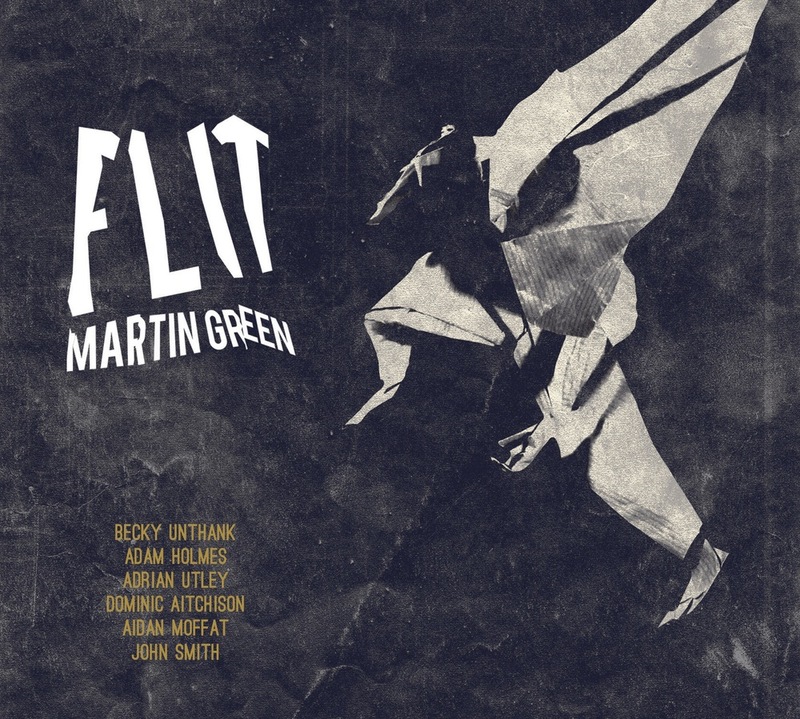 Flit was mixed by Martin Green, T.J. Allen and Adrian Utley. With the album mixed, Flit was mastered at Optimum Mastering. Now that the album was recorded, Martin Green sophomore solo album was ready for release. Before that, Flit with its theme of “human movement around the world,” was premiered at the Edinburgh International Festival. Flit was well received by critics. Buoyed by the critical acclaim Flit had received at its Edinburgh premiere, Reveal Records scheduled the release of Flit for the 7th of October 2016. Martin Green’s much anticipated sophomore album Flit, you’ll soon realise, is a powerful musical document. The Living Wind opens Flit. The arrangement squeaks and chirps before the buzzing bass synth enters. It dominates the arrangement until Aidan Moffat delivers an emotive soliloquy. He remembers and reflects upon what happened. “They fled in fear when we flew into town…our legion crew silenced them, drowned out their prayers, eventually we passed, they didn’t understand we didn’t speak their language.” Soon, though, he’s trying to justify his actions: “we were hungry, they were hungrier.” Later, when the vocal drops out, the arrangement takes on a cinematic sound, as mesmeric, chirping guitars combine with synths.” When the vocal returns, Aidan remembers when those who fled from him, came seeking revenge and retribution. “They brought fury and fire.” Suddenly, the hunter is the hunted. Those that survive, are forced to flea for their lives, and become displaced and traumatised. It’s a chilling and powerful soliloquy, where Aidan brings the lyrics to life against a slow, atmospheric and cinematic arrangement. Atmospheric, dark and moody describes the introduction to Strange Sky. The arrangement reverberates, as a wash of synths combines with understated, metallic drums and what sounds like the sound of traffic. They provide a hypnotic backdrop to Becky’ Unthank’s vocal. Her vocal sounds bereft of emotion, as if she’s tired of being displaced and finding herself: “under a Strange Sky.” Meanwhile, the arrangement sounds as if it’s portraying a journey. Is she being smuggled across a border? A bass, guitars and drums combine. Later, the drama combines as the arrangement roars, buzzes and beeps, heading in the direction of post rock. By then, the vocal grows in power and emotion. When it drops out, strings sweep wistfully, adding to the sense of sadness and desperation. Becky returns in Wrackline, where just percussion, piano and bass combine with her melancholy vocal. Effects are added to her vocal, giving it a lysergic hue as she sings: “washed up on the shore.” Soon, though, the effects disappear, as Becky’s vocal becomes crystal clear. She reminisces about what’s: “washed up on the shore.” Before long, effects are added to the vocal, and a blistering, choppy guitar and bass cuts through the arrangement. It’s joined by a piano and percussion which add to the drama, as the arrangement begins to meander moodily along. That’s until the arrangement explodes and Becky’s vocal becomes ethereal. Later, it becomes understated and almost a lament, as she stands by the Wrackline and promises to: “cherish the child of the sailor whose not coming home.” It’s a truly moving song that’s tinged with sadness. Notes are picked out on a piano on Roll Away, before a guitar accompanied Adam Holmes’ tender vocal. Against this understated backdrop, he paints pictures with his heartfelt vocal. It grows in power and emotion as he sings of: “railway lines and ocean liners, it never will be a home to any, sail away, Roll Away.” There’s a sadness in Adam’s voice as he realises this. Later, when after “seven years I left you lonely, railway lines and ocean lines, if I come back home would you even know me?” Sadness fills his voice as he realises he’s far from home, lonely and lost his true love, for the “jaunt” he took seven years ago. Roll Away is a truly beautiful song, and without doubt, the best on Flit. The Suitcase marks the return of Aidan Moffat, who delivers another soliloquy on this song of two parts. During the first part, Aidan remembers: “my dad always kept a packed suitcase in the hall.” Suddenly, Aidan is remembering a proud, quiet, fair, hard working and complex man. He was: “driven to protect and survive…he strove to prepare us all for the future, long signed, very aware you can only really rely on yourself.” Behind him, the arrangement is almost incidental. Just shakers and subtle keyboards provide a backdrop. That’s until 1.59 when Becky’s vocal enters. By then, the arrangement has taken on a dark, ominous sound. Soon, Becky sings: “The Suitcase in the lobby is always packed and ready…the only thing you need to know is when it’s time to go. The train leaves in the station, each coach is lined with silver and gold, and in his dream, everyone grows old.” Later Becky is joined by Adam and they share the vocal duties. Sometimes, a chiming guitar is added and Karine adds ethereal harmonies. Always, the song is cinematic, right up to the closing line, when Becky sings: “The Suitcase in the lobby is always packed and ready.” It’s a memorable, cinematic song that’s rich in imagery, thanks to Becky’s vocal and Karine Polwart’s carefully crafted lyrics. Layers of synths meander, producing an otherworldly backdrop on Laws of Motion. Providing a contrast are the guitar which accompanies Adam’s vocal. He becomes a storyteller, and paints pictures with the lyrics. They come to life. So much so, that the scenes become very real. Still, synths provide a backdrop. They provide an atmospheric backdrop when his vocal drops out. Later, when his vocal returns Becky accompanies him. His vocal grows in power, as synths buzz and reverberate. Together, they play their part in what’s a powerful and poignant song. Clang Song is akin to a post rock soundscape. Synths are to the fore, as they buzz, beep and squeak. Sometimes, they fire off a round of scratchy sounds. Then they grind, beep, squeak and buzz, as if sending out a code. Other times, it’s like some industrial symphony, where the music is dark, ominous and moody. Later, the arrangement is transformed, and becomes melodic, hopeful and dreamy. These are two sides of a captivating soundscape. Martin Green’s accordion plays slowly on Smallest Plant, creating a melancholy sounding arrangement. Soon, though, it’s all change. As a beat is tapped out, the a bass anchors the arrangement. Meanwhile, a crystalline guitar plays. Effects are deployed, adding a choppy backdrop. This doesn’t affect Adam and Becky’s vocals, as they become one. Still, the arrangement grinds, as just the bass and guitar remain. They briefly replace the heartfelt vocals. When they return, they’re joined by a guitar. This allows the vocals to take centre-stage, on this moving ballad. Closing Flit, is The Singing Sands. As is often the case, it’s a case of keeping one of the best until last. Against an understated arrangement, where a chiming, chirping guitar accompanies Adam delivers a soul-baring vocal. This impassioned and hurt filled vocal, is reminiscent of Sting on his early solo albums. That’s how good Adam Holmes’ vocal is. Let’s hope we hear more from Adam Holmes and Martin Green very soon. Thirty months after the release of his debut solo album Crow’s Bones, Martin Green will returned with his sophomore album Flit. It will be released on Reveal Records on the 7th October 2016, and is without doubt, well worth the wait. To record Flit, Martin Green brought onboard some of his musical friends. This included Karine Polwart who cowrote four of the nine songs. Among the other collaborators were the inimitable Aidan Moffat, who wrote the lyrics to The Living Wind and contributes soliloquies on two songs. Then there’s Mogwai bassist Dominic Aitchison, who plays a part in the post rock sound of a couple of tracks. Adrian Utley of Portishead played on, co-produced and helped mix Flit. He helps craft arrangements that are atmospheric, dark, moody and sometimes, ominous. They prove the perfect backdrop for the vocals. On Flit, most of the vocals come courtesy of Adam Holmes and Betty Unthanks. They breath meaning and emotion into the lyrics. These songs document “human movement around the world.” Some of the songs on Flit are tinged with sadness, despair and disappointment. Others document suffering and tragedy. Adam Holmes and Betty Unthanks. bring these songs to life. Sometimes, they sound as if they’ve lived and survived the lyrics. Other times, it’s as if Adam and Betty are determined to highlight other people’s plight and suffering. These vocals play an important part in the sound and success of Flit, a genre-melting album. Flit was recorded during Martin Green’s recent departure from “the mothership.” It’s something that the three members of Lau having been doing since the early days of the band. This time around, Martin Green with a little help from his friends, has recorded Flit, which is a career defining album, that will set the bar high for future solo albums. ← THE WELCOME RETURN OF BOB LIND.